When uptight Catholic server, Eileen (Kathleen Turner), accidentally spills a handful of communion wafers and secretly shoves them in her mouth with the exquisite clumsiness of Lucille Ball at the chocolate factory, I was fully prepared for this film to devolve into a caustic slice of familial dysfunction along the lines of “Another Happy Day,” populated with shrill stereotypes and Puritanical basket cases. “The Perfect Family” could’ve easily been that movie, but it isn’t. In fact, it’s a much more tender and thoughtful picture than one would expect. With her gloriously raspy voice and killer deadpan timing, Turner is her generation’s answer to Tallulah Bankhead. Her skills as a comedian have been undervalued of late, a fact that I was reminded of throughout Renton’s film. Yet aside from a few pointedly funny lines, the film struck me as more of a warmhearted drama than a laugh-out-loud comedy. As a devout servant of God, Eileen has freely accepted the church’s moral doctrine without question. When she’s nominated for the rather absurd title of “Catholic Woman of the Year,” the model housewife struggles with the question of how to portray her family before the judgmental eyes of her righteous flock. Eileen’s husband, Frank (Michael McGrady) is a former alcoholic, a status that she’s determined to never let him forget. Her son, Frank Jr. (Jason Ritter), has escaped his crumbling marriage by delving into an affair with a local manicurist, while her daughter, Shannon (Emily Deschanel), has recently outed herself as a lesbian. Apparently everyone else in Shannon’s life was already aware of this fact, but the young woman couldn’t bring herself to inform her god-fearing mother of her sexuality. Shannon’s reluctance is understandable, but it’s admittedly unfair of her to give Eileen little time to digest this news mere days days before her wedding. It’s details like these that make Eileen’s predicament more relatable and sympathetic than it might’ve been otherwise. 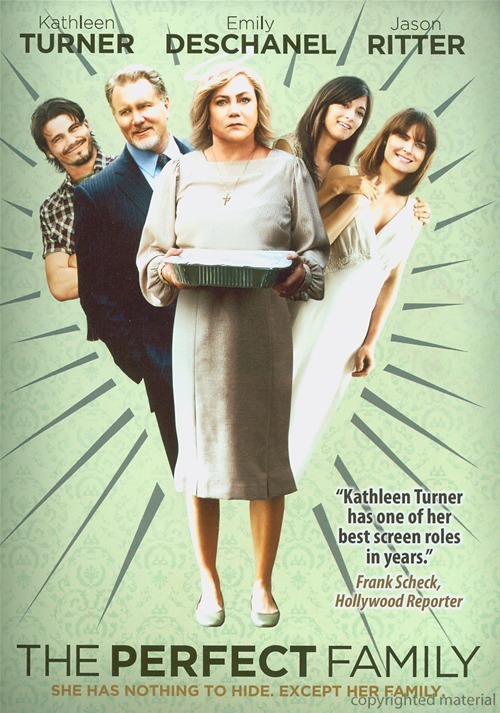 The Perfect Family was released on DVD on June 26, 2012. The film’s plot is in the classic tradition of sitcom formulas, but the script by Paula Goldberg and Claire V. Riley doesn’t aim for easy punchlines. Instead of demonizing Catholicism, the film represents the church as a refreshing mixture of stern prudes and more progressive thinkers, such as a twinkly eyed monsignor played by Dr. Kildare himself, Richard Chamberlain. When the rigidity of church guidelines conflicts with one’s inherent humanity, the film argues that places of worship can indeed evolve with the times. Eileen represents a particular segment of the church population that instinctively avoids change for fear of getting singed with hellfire. This instinct results in well-meaning people of faith ceasing to think for themselves. The best exchange in the entire film emerges during a pivotal confrontation, as Eileen desperately attempts to tell Shannon that her lifestyle is sinful. Some viewers will undoubtedly interpret this line as a swipe against the church, but I took it as a satirical portrayal of certain churchgoers’ tendencies to favor ignorance over advancement. Eileen is not a monster nor is she a fanatic. She’s a natural-born caregiver so concerned with “doing the right thing” that she’s forgotten that the definition of “right” lies first and foremost within the human heart. The script nails Eileen’s specific worldview in many small and delightful nuances, such as when she spots Shannon attending a soccer game after a near miscarriage and shouts, “You shouldn’t be playing baseball!” Though the film isn’t as funny or insightful as one might’ve hoped, it presents an unconventional portrait of a modern Catholic family that is most welcome in light of America’s current cultural divisiveness. It may not be a flawless picture, but it does end on the perfect note. ‘The Perfect Family’ is released by Virgil Films and stars Kathleen Turner, Emily Deschanel, Jason Ritter, Michael McGrady, Elizabeth Peña and Richard Chamberlain. It was written by Claire V. Riley and Paula Goldberg and directed by Anne Renton. It was released on June 26, 2012. It is rated PG-13.